Once again due to popular demand, we have chosen the excellent and Solos favourite, the El Rompido Golf Resort to host our Autumn 2019 Golf Festival. El Rompido ticks all the boxes for a golf holiday; 2 superb, contrasting golf courses on site, an elegant clubhouse to relax in for post-round refreshment, and a stylish, lively hotel to chill out in later in the day. 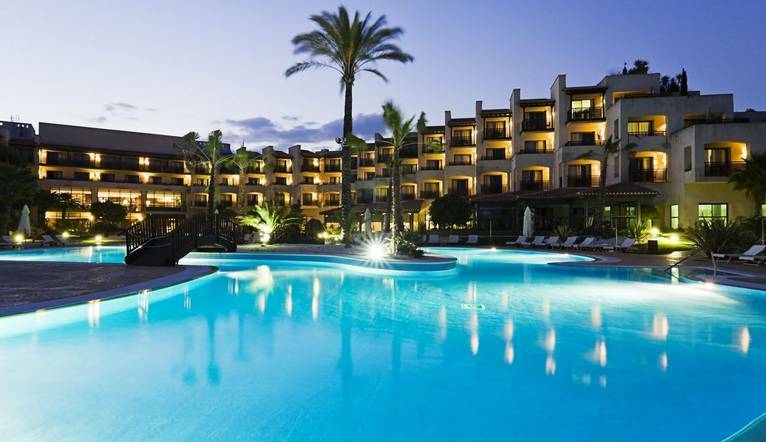 Situated on the Andalucian coast in Spain, the Costa de la Luz provides a sunny base for our Festival Week, as well as great value when you consider that all evening drinks at the hotel are included in the price. As a valued partner of the El Rompido all our golfing guests will receive an automatic upgrade to a a Superior Room. 5 rounds of organised golf on El Rompido North & South Courses, including 2 Individual Stableford Competitions for Ladies and Gents. The highly rated North Course, according to the Peugeot Guide to Europe's Top 1000 Golf Courses, is a monument to modern golf, intelligent and entertaining. It is the longer and wider of the 2 courses, but both are relatively flat and walkable. It combines power with precision; intelligent because it makes you think about your strokes: and entertaining because its medium-sized greens will entertain both the most skilled player and those with higher handicaps alike. Situated within the protected natural marsh area of Las Marismas del Rompido, the South Course's varying landscape provides some spectacular holes, where strategy and precision are often the key to scoring a good round. Running alongside the clubhouse, the front and back nine have completely different characteristics, both in terms of technique and landscape. The pine forest alternates with olive trees and wetlands, requiring golfers to use strategy and precision in their strokes. Away from the course, if you fancy a change of scene, you can walk to the local village, also named El Rompido, where there are plenty of bars and restaurants to sit back and enjoy a glass of wine and a tapas. Alternatively a visit to the wonderful Andalucian city of Seville, the birthplace of bull-fighting, tapas and flamenco, is highly recommended. Situated in the heart of the golf courses, this chic hotel will provide us with a stylish, yet comfortable base for our Festival Week. The guest rooms are all elegantly designed to offer maximum comfort. All rooms have en suite facilities with air-conditioning, a minibar, satellite TV, safe, Wi-Fi, hairdryer, bathrobe and slippers. The hotel's sleek interior has a Scandinavian feel, and facilities include a bar, restaurant, chic nightclub, spa and outdoor pool. The transfer time from Faro Airport to the El Rompido Golf Resort is approximately 90 minutes, depending on weather and traffic. 5 rounds of organised golf per week on El Rompido North & South Courses.